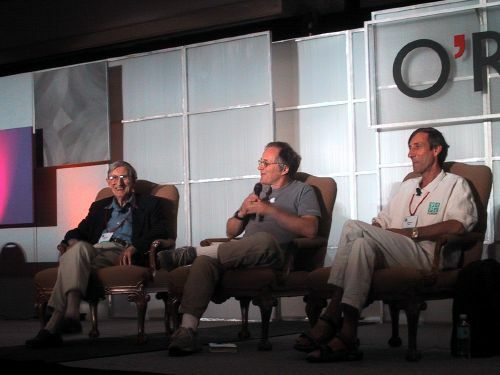 I saw Freeman Dyson and his son George, along with Tim O'Reilly as moderator, at this morning's keynote at OSCON. It was wonderful to hear such people talk about technology and the future. Esther (Freeman's daughter) was supposed to attend too, but she was stuck at the airport in Dallas. As Tim O'Reilly put it, she was stuck in Texas, like our whole country at the moment. Published on July 29, 2004 7:27 PM.